Every cake is freshly baked and decorated in our commercial kitchen studio in Cholesbury, Buckinghamshire. It has become a bit of a cliche, but we absolutely believe that every cake should taste as good as it looks and are constantly experimenting with new recipes, new flavour combinations, low sugar and vegan options. We use only the finest ingredients, always free range and where possible organic, baking each individual cake with care to ensure the end result is always fresh, moist and tastes wonderful. We use truly free range eggs, organic fairtrade coffee, home-made fruit preserves and syrups and Barry Callebaut couverture chocolate from Belgium. Our fruitcakes contain brandy-soaked vine fruits as well as apricots and spices including: cinnamon, ginger, clove and nutmeg. Every cake is baked and decorated in our commercial kitchen studio in Cholesbury, Buckinghamshire. It has become a bit of a cliche, but we absolutely believe that every cake should taste as good as it looks and are constantly experimenting with new recipes, new flavour combinations, low sugar and vegan options. We use only the finest ingredients; always free range and organic wherever possible. We exclusively use Callebaut Belgium chocolate. Rich Chocolate Cake, made with 70% Callebaut chocolate and layered with salted caramel and dark chocolate ganache. This cake is moist and improves with age. It is ideal for large multi-tiered cakes, as well as small cakes served as dessert. Covered in a layer of ganache it also creates the sharp fondant edges. Elderflower, Yogurt & Pistachio Cake, layered with elderflower buttercream. This cake is gluten-free and has an almond base. It is ideal for small tiers. Spiced Carrot & Ginger Cake, made with grated carrot, fresh ginger, sultanas and layered with spiced white chocolate ganache or swiss buttercream icing. Layered with lime mint swiss buttercream. This cake is wonderfully moorish and gluten-free. Ideal for small tiers. This cake is gluten-free and dairy-free, made with whole oranges. This cake can be layered with dark chocolate orange ganache, white chocolate ganache or orange swiss buttercream. The dark chocolate ganache can be made with coconut milk to be dairy-free too. 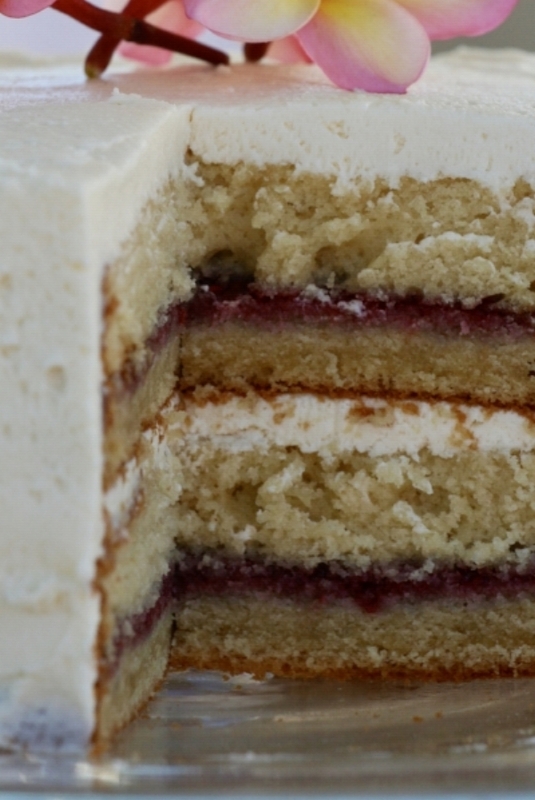 Raspberry & White Chocolate Cake, layered with white chocolate ganache or buttercream icing. This cake is a great alternative to vanilla sponge when the design is intricate, multiple or large tiers are needed. Our cake tiers are all 5”/13cm high and consist of four layers of cake and three layers of filling. The size and number of tiers depends on how large you’d like each cake portion to be. 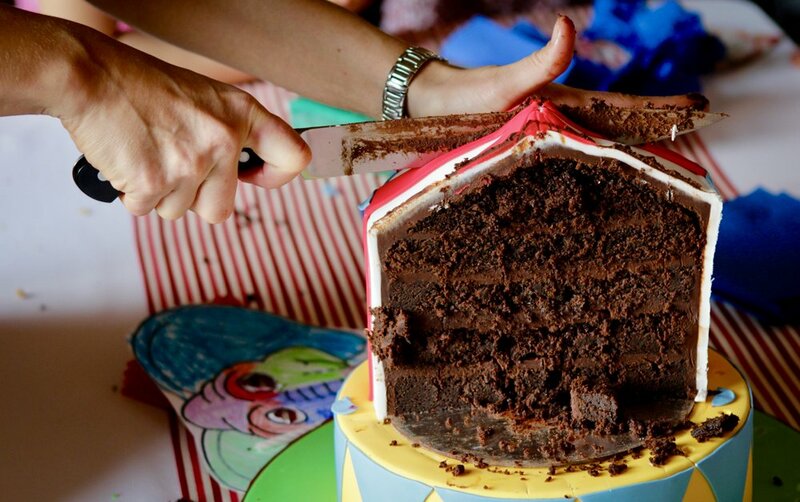 If you are serving the cake as afternoon tea, you might want a good slice per guest, whereas if you are serving the cake at the end of a three course meal, you might only need a small finger of cake. These sizes are a general guide.